Purdue University Press, 9781557533159, 252pp. The history of exile literature is as old as the history of writing itself. Despite this vast and varied literary tradition, criticism of exile writing has tended to analyze these works according to a binary logic, where exile either produces creative freedom or it traps the writer in restrictive nostalgia. 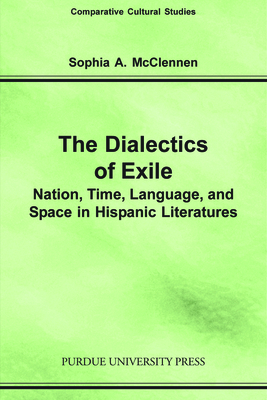 The Dialectics of Exile: Nation, Time, Language and Space in Hispanic Literatures offers a theory of exile writing that accounts for the persistence of these dual impulses and for the ways that they often co-exist within the same literary works. Focusing on writers working in the latter part of the twentieth century who were exiled during a historical moment of increasing globalization, transnational economics, and the theoretical shifts of postmodernism, Sophia A. McClennen proposes that exile literature is best understood as a series of dialectic tensions about cultural identity. Through comparative analysis of Juan Goytisolo (Spain), Ariel Dorfman (Chile) and Cristina Peri Rossi (Uruguay), this book explores how these writers represent exile identity. Each chapter addresses dilemmas central to debates over cultural identity such as nationalism versus globalization, time as historical or cyclical, language as representationally accurate or disconnected from reality, and social space as utopic or dystopic. McClennen demonstrates how the complex writing of these three authors functions as an alternative discourse of cultural identity that not only challenges official versions imposed by authoritarian regimes, but also tests the limits of much cultural criticism.